Just east of Seattle, Wilkomish sits on 3 acres of towering evergreens amidst the verdant natural beauty of the Northwest. Straddling a river that cascades over granite rock, the property offers complete privacy for a relaxing, fun getaway with family or friends--or solitude for individual respite or creative time. The charming house has a spacious master suite with spectacular river views. Two other bedrooms sleep 4. A well-appointed kitchen is new. The dining room seats up to 10. Log walls line the living/gathering room (in the original part of the house). Outdoor features include a large deck, hot tub, gas grill, gazebo, footbridge [crossing the river to a playhouse], fire pit, small ponds, and a level lawn area spacious enough for outdoor games. Our river house, while secluded and peaceful, is just 20 to 30 minutes from activities and events in downtown Seattle and a 25-minute drive from the Seattle/Tacoma airport. 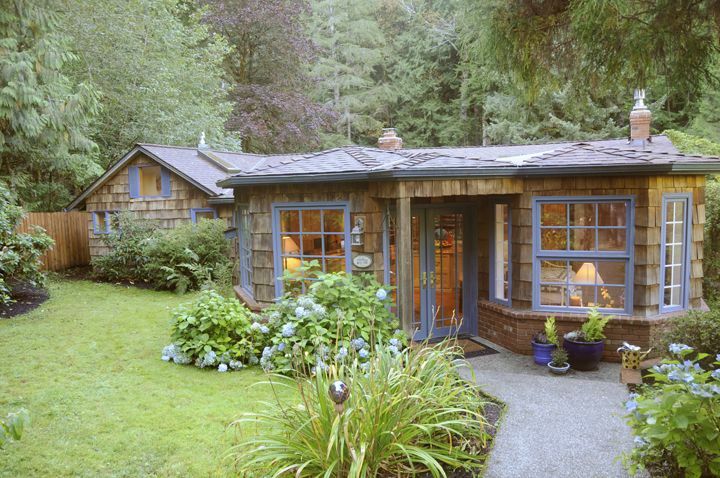 The Property: Wilkomish sits on 3 acres of private, verdant Northwest forest. Pass the large frog pond on your left, and park your car at the bunkhouse, then walk along a short path past a tiny pond to the main entrance of the cottage. The back yard features a large deck with chairs and tables for eight. Relax in the jacuzzi and gaze up at the fir trees and sky. Perhaps our blue heron will visit. Walk toward the gazebo to see the expanse (250 feet) of riverfront. Cross the footbridge to visit our little playhouse at the edge of Tiger Mountain State Forest. Complete privacy, with no neighbors in view in any direction. At night you might want to light some logs in fire pit or play games on the expanse of lawn bordered by the river and our third pond. Due to our allergies, we respectfully ask that you leave your pets at home. Smoking is not allowed. Wilkomish sits on a stone-lined, clear water river at the end of a county road. It is secluded and quiet, but only 3.4 miles from I-90. Seattle is a pleasant half-hour drive away. In half an hour, you can be listening to the Seattle Symphony, touring the unique [Frank Gehry-designed] Rock and Roll Museum or Seattle Art Museum, or visiting Pike Place Market. Within 45 minutes by car, you can be on a ferry to one of the picturesque islands in Puget Sound, or skiing at a Cascade mountain wonderland. Seattle offers all of that and much more; there is something for every interest in this beautiful area! Gorgeous scenery, alpine hiking, mountain biking, water sports are all within reach during your stay. Master bath includes 2 sinks and a large shower. Skylights keep the room bright, and the heated floor keeps your feet warm in winter. Behind pine doors find the washer and dryer. Beyond the river in the back yard, the Tiger Mountain State Forest rises up the mountain (Tiger Mountain). There are many trails on the other sides of the mountain, very close. Our deck that extends from the house to the river; it's very close! We love the sound of the water whether we're outside or in. We have a high bank, so there's no risk of flooding. We will give you a password so you can use the internet. Table extends to seat 10 people. Normal seating is 6. Kitchen has all the basic supplies: spices, herbs, oils, vinegars, sugar, brown sugar, powdered sugar, cinnamon, salt, pepper, baking soda, baking powder, flour, cornstarch, ketchup, mustard, mayo, salad dressings, coffee filters for the coffee maker, and so forth. Plenty of dried parsley, for sure (guests have left several bottles). This secluded home is so much fun. It is lovely. It is different. It is spacious. Fabulous yet livable. We loved the relaxed feel and enjoyed the charming amenities. The kitchen! We cooked all our meals and had a grand time in this dream kitchen. You won't want to leave. The house, the setting, the accommodations...absolutely perfect! A great kitchen, plenty of space, the hot tub beside the rushing river...we loved it all! What a wonderfully unique home for midwest city kids to explore the richness of the Pacific Northwest! With so many special features - the upstairs reading nook, the enchanted grounds, the peaceful river - making memories was easy during our summer holiday. We've rented a fair amount of vacation homes, but this was certainly a family favorite. Surprisingly close to Seattle for day trips and adventures and yet a quiet and secluded refuge perfect for relaxing in nature. Highly recommended! This house and location is jaw dropping. The landscaping is spectacular and you just can't get enough of the scenery. We saw a bald eagle fly over head right in front of us while we sat in the hot tub. Only 20 minutes from Snoqualmie Falls, which was a great side trip. We made a campfire and enjoyed the hot tub and deck. Would absolutely recommend this house and would love to come back. A fairy tale getaway just minutes from everything. We were in search of peace, privacy and a fun place for the kids to play while the adults relaxed. We also didn’t want to travel for hours. This home exceeded our expectations in every way! The minute you step foot inside it’s clear that this home is full of love. From the kid’s toys and great collection of books to the family pictures and wonderful sayings spread everywhere, you’ll spend hours just walking around, exploring and smiling. If you’re looking for a fairy tale getaway near everything, consider this home for your next vacation! We're happy you enjoyed our retreat in the woods. It's a magical place to get away from city living, for sure. The river is low in the summer, more like a creek. We hope the rest of your summer is great. Thanks to the Hatch's for sharing the riverhouse with Festival of Trees as a donation. As the lucky bidder on this weekend get away, we had a great weekend. Loved the fire pit next to the river and the hot tub. We enjoyed watching a bald eagle cruise down the river one of the evenings we were at the fire pit. The cottage has lots of entertaining space for larger groups, we enjoyed the large island /bar. Perfect getaway 30 minutes out of Seattle. Quiet and secluded, Wilkomish sits on the banks of the Raging River in Washington's Cascade mountains. Though it feels like a remote forest, our river property is just ten minutes away from shopping centers and restaurants and only half an hour from Seattle. Other Activities: There are many scenic hiking trails within a few minutes of our river house. Gorgeous views from biking trails are close by. Golf: Three golf courses are within a 15-minute drive of the river house. Ski: Ski at The Summit at Snoqualmie or at the Alpental Ski Area(both about 45 min. east on I-90). Stevens Pass Ski Area is about 90 minutes by car on Highway 2 in Leavenworth, WA.